I was recently invited to speak on the subject of fraudulent candidates and fake clinical research associates (CRAs) at the Global 2018 ACRP Conference and was astonished at how many hiring managers were not aware applicant fraudulence exists. The data we have gathered is startling, as we have already identified over 7,000 fake CRAs in North America, which is roughly 21 percent of our CRA candidate pool. My goal is to help hiring managers better protect their companies by revealing the extent of candidate fraudulence within the clinical research industry. I do want to clarify that I am going to be discussing true applicant fraudulence, as many hiring managers confuse applicant fraudulence with the embellishment of credentials. In terms of embellishment, I suspect that candidates have been overstating skills, exaggerating achievements, stretching employment dates, and inflating titles for as long as the resume has been in existence. When it comes to defining “fraud,” candidates exaggerating their qualifications, such as overstating their skills or exaggerating achievements, could be classified as fraudulent. Our firm agrees that embellishing or inflating qualifications is wrong; however, this type of embellishment is not what we would use to classify someone as a fake CRA or fraudulent candidate. We define a fraudulent applicant as someone who has completely falsified all or part of their credentials, such as providing falsified employment history on resumes, representing fake degrees, and/or giving fake references. My typical response is: But how do you know if you are actually interviewing the applicant? For example, when calling a candidate for a scheduled phone interview, you will rarely be 100 percent sure the person you are communicating with is the original applicant, as there is no way to tell if the call has been forwarded to a friend or colleague who actually has the experience represented by the fake CRA. A robust interview process and hiring approach will include multiple qualification checkpoints beyond the initial phone interview, as a phone screen alone will not protect your organization from fraud. Someone else will actually take the video interview on the fake applicant’s behalf. I have spoken with several hiring managers who have proved the person completing the video interview was a professional interviewer instead of the original applicant. In some cases, the fraud went unchecked until the new hire showed up for work. In other cases, the fraud was not noticed for several months because in larger companies, the interviewer is often not the new CRA’s line manager; therefore, no one noticed the individual who showed up to work was not the individual who completed the video interview. Another common trick is for a hired interviewer to complete a “voiceover” during the video interview. This “Milli Vanilli” notion sounds silly, but don’t discount it, as I have heard of several instances where the video interviewer was lip synching while someone else provided answers to the interview questions. We have also experienced situations where answers to the interview questions were typed to the candidate’s computer via a remote tool such as Team Viewer. This can be done from anywhere in the world and is extremely difficult to catch. And probably the most common trick is where the candidate experiences a “technical issue” whereby the video doesn’t work; in reality, someone else besides the applicant is answering the interview questions. If your company conducts video interviews, always ask the candidate to scan and email a copy of their driver’s license or government ID to you prior to an interview. Additionally, I recommend you have someone conduct a dry-run with the candidate prior to the scheduled interview to ensure the applicant’s video and sound are working properly. This simple step will enable you to immediately reject any candidates who experience a “technical issue” causing them to not have an operational camera during the video interview. Face-to-face interviews are highly effective in determining fraudulence; however, a common mistake we see is where sponsors and CROs assume that their clinical operations managers will automatically make great interviewers. You must ensure your hiring team has been prepared to conduct effective interviews. You should use an interview template to drive consistency. Starting each interview with the same questions will enable you to conduct an “apples to apples” comparison when reviewing your notes. The template will also ensure you stay on track by ensuring critical questions are asked. As a side note, you should expect your interview questions to be broadcast on the internet, which is why the next bullet is so important. Ask situational questions and guard against vague and/or hypothetical responses. 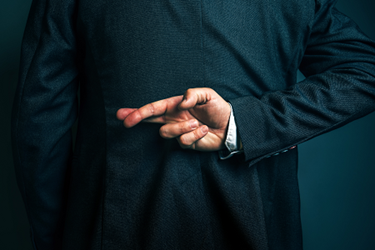 We have identified a couple of organizations that will (for a fee) train fake CRAs to pass interviews; therefore, it is important that your interviewers understand how to dig. Experienced CRAs will have real examples to share and will be able and willing to provide details on their projects. Train your interviewers to delve into the candidate’s responses by asking the CRA to elaborate on any examples given during the interview. A series of “why,” “how,” and “when” questions will help, as the inexperienced candidate may be able to provide answers to the first question on a given topic, but as you continue to dig deeper on the same topic, the lack of real experience will become evident. Ensure your interviewers take lots of notes (preferably on the interview template) and ensure you save them (forever). Documenting the candidate’s responses and reactions as well as noting any flags you may have will be extremely beneficial for a couple of key reasons. First, if the candidate is interviewing with multiple people, you can compare history and stories in order to identify discrepancies. Second, you can reference your notes later when you are deciding which candidate to move into a face-to-face interview or if you decide to re-interview the candidates several months or years later. Finally, train your interviewers to know when to be silent during the interview. Pauses by the interviewer will force the candidate to speak more, which will highlight any weak areas that may otherwise go unnoticed if the interviewer is talking too much. Even though we have provided several precautionary steps to mitigate interview fraudulence, when someone challenges me with the question of whether the interview will reveal a fraudulent candidate, my counter is always why waste your time interviewing fake candidates? As a hiring manager, your primary goal should be to detect candidate fraudulence long before the interview takes place, and the next part of this series will identify a few trends to keep in mind.